Whilst I normally steer clear of this kind of book, I saw it in a local library and thought I’d have a look, thinking there might at least be a few useful tips. Unfortunately, I was not only disappointed on the tips front, but in the general presentation of this book. Like a previous viewer, I was left rather perplexed as to exactly who the book is aimed at. The blurb suggests it is designed for people planning to build professional, rather than personal websites, and yet the content never quite seems to match up. At once Lopuck suggests that when providing designs for clients you should delegate to members of your team (also dummies, presumably?) so that the designs reflect different interpretations of the requirements, and a few pages later, something as mundane as copying and pasting images will be covered. The book is so riddled with such strange juxtapositions that it really ends up being of very little use to anyone. 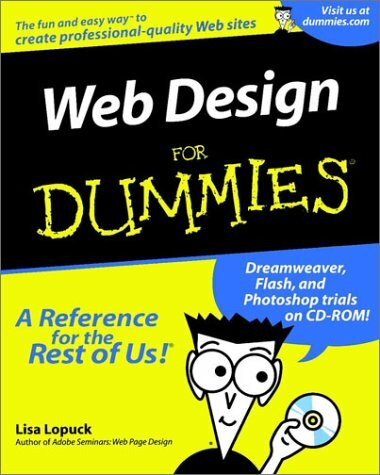 Real beginners will be sorely disappointed by many of the chapters, which assume either a background in print design, or that the reader is already a member of a web design team (begging the question, why they should be reading a book purportedly for dummies), or perhaps that the reader already owns software such as Dreamweaver, Fireworks or Photoshop. More experienced readers may find a few useful tips, but I should imagine have already covered the key sections of this book elsewhere, and will only be insulted by the more mundane chapters on the vagaries of web adaptive palettes or font types.